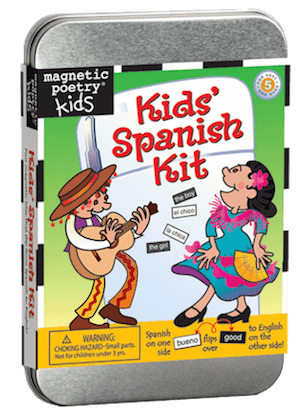 Created with the help of native speakers and language educators, Kids' Spanish is a friendly way to help immerse ninos y ninas en Espanol. Each tile is printed on both sides and sticks both ways, with a Spanish word on one side and its English translation on the other. Great for adults too! Includes over 200 double-sided, magnetic word tiles. For ages 5 and up. Individual tiles are .375" tall. Package size is 4.75w x 6h x 1.25"d. For ages 5 and up.